The granddaughter of a senior member of the Titanic’s crew has revealed in a new book what she describes as a family secret kept for decades: that a simple steering error caused the ship to strike an iceberg and sink during its maiden voyage in 1912. Louise Patten, a novelist whose new book, “Good as Gold,” mixes fact and fiction, told The Telegraph that her grandfather, Charles Lightoller, the senior surviving officer from the shipwreck that killed 1,517 people, told his wife that the man steering the ship when the iceberg was spotted had simply turned the wheel the wrong way. 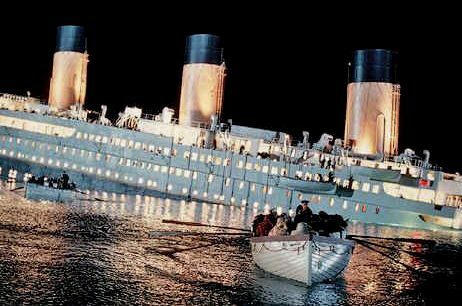 “Instead of steering Titanic safely round to the left of the iceberg, once it had been spotted dead ahead, the steersman, Robert Hitchins, had panicked and turned it the wrong way,” Ms. Patten said. She added that her grandfather, who went on to become a war hero, “was lying” when he told investigators looking into the cause of the wreck that he had no idea what had happened. Ms. Patten said that the ship’s captain and first officer told Mr. Lightoller, the second officer, about the steering error after the crash but he had concealed the truth to protect the reputation of his employer. Titanic was launched at a time when the world was moving from sailing ships to steam ships. My grandfather, like the other senior officers on Titanic, had started out on sailing ships. And on sailing ships, they steered by what is known as ’tiller orders’ which means that if you want to go one way, you push the tiller the other way. It sounds counterintuitive now, but that is what tiller orders were. Whereas with ‘rudder orders,’ which is what steam ships used, it is like driving a car. You steer the way you want to go. It gets more confusing because, even though Titanic was a steam ship, at that time on the North Atlantic they were still using tiller orders. Therefore [the first officer, William] Murdoch gave the command in tiller orders, but Hitchins, in a panic, reverted to the rudder orders he had been trained in. They only had four minutes to change course and by the time Murdoch spotted Hitchins’s mistake and then tried to rectify it, it was too late. Hichins had 10 years experience, seven of those as a quartermaster. He sailed the Titanic for four days before the accident, during which he did shifts of four hours on, four hours off. He would have steered the vessel during these times, so been familiar with the systems. He knew ships. These were experienced men, a very experienced crew. I completely disagree with this theory.